It was brutally hot here last year. There was no rainfall. When the water tables dropped, streams dried and trees died. It didn't rain until late fall. This summer has been hot too, with humidity as thick as sorghum syrup. The difference is that we've had a lot of rain. The fruit trees bounced back, but most of them didn't have much fruit. The exception was the blueberry bushes. We soaked their roots with city water from a hosepipe. They prefer rainwater, but nature is not choosy when it comes to survival. 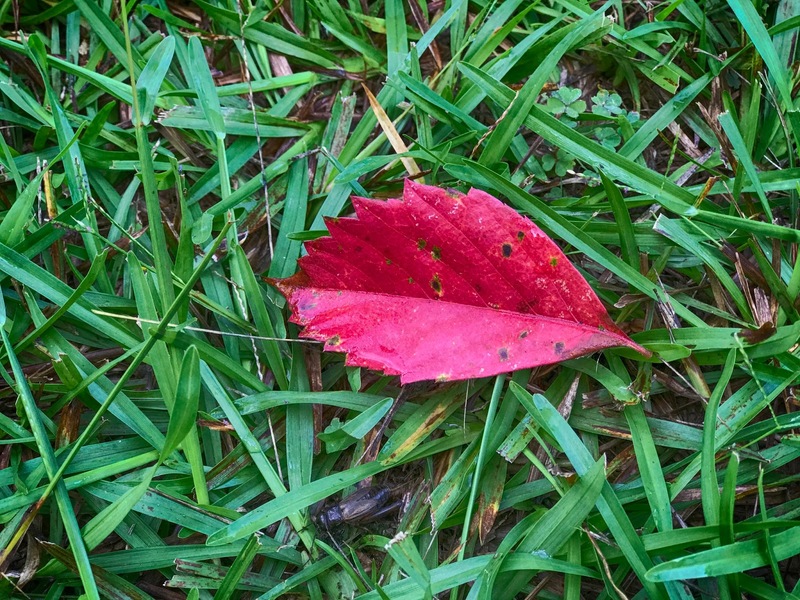 This morning when we walked, I saw a crimson leaf from a poison ivy vine on our path. 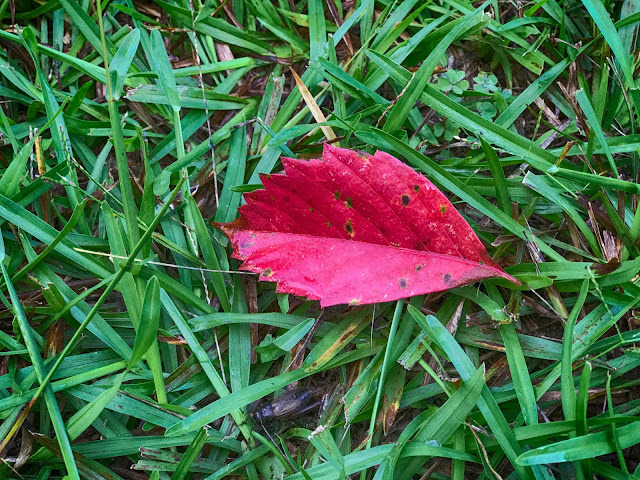 The wind from a thundershower must have swept the leaf from a nearby plant. My knees creaked as I squatted to shoot a picture. I smiled as I stood because I understood that the leaf is a harbinger of autumn. Such a vivid reminder of the arboreal fireworks to come. I admire your eye thru the camera! Ive never heard of "harbinger" of Autumn. I had to google it. haha. now it all makes sense. A Perfect preview of fall. Hard to believe summer is almost over. It's been warm here in Portland but not too bad. I have been watching with delight as the leaves on the sumac have been turning that bright blood red. Gorgeous. It may be nasty, but it's pretty!! We are having some cooler days here this week, also a harbinger of fall. While I've enjoyed them, I truly will miss summer. Even though it is vibrant red...ick to poison ivy as I had a horrible experience from it many moons ago. look at the fly..or is it a wasp?? in the lower left.